As flexible as its name suggests, Flex-Beam offers an effective buffer, at the same time as minimising vehicle damage. Standard Flex-Beam guard rail is designed ideally for durability and resilience, with the joint strength to absorb heavy impacts and a hot dipped galvanised finish for a longer lasting product. Ideal for installation in areas where vehicle impact is expected but less severe, such as car parks. A rigid support is required so that the posts dont get pushed out of line. 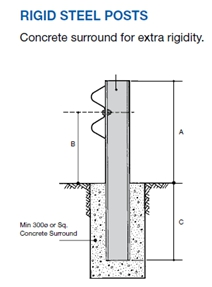 These posts can be surface mounted or concreted in. Able to absorb high impact meaning barrier replacement and maintenance costs are reduced. Used mainly in car park applications. For any further information or specification on Armco barrier please contact the store on 01204 578012.